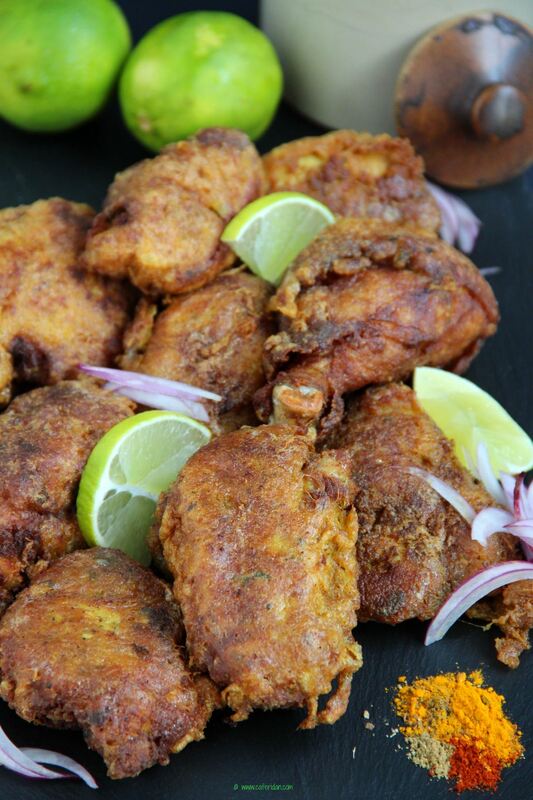 Today is my mom’s birthday and I am sharing one of her favorite Parsi dishes to eat – Margi na farcha or fried chicken! I owe what I am today to my mom. Rain or shine she has always been there for us…always smiling, always happy and always positive. Happy Birthday Ma! 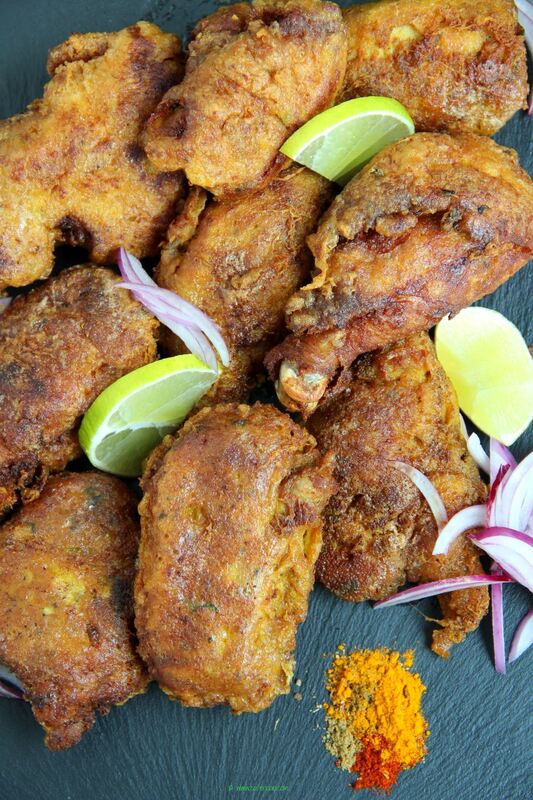 Margi na farcha is the Parsi equivalent of KFC but much more flavorful! We begin by marinating the chicken with spices, ginger, garlic and lime juice. Dipping the chicken in egg just before frying helps to seal all the flavors inside and mixed with the breadcrumbs forms a delicious, crispy crust. I prefer to use dark meat but you can also use white meat. Traditionally the chicken that is used to make farcha is bone-in and it takes longer to cook so if you are in a rush use boneless chicken. Every mouthful is just a burst of flavor and textures. Crisp on the outside and spicy, tart, warm and juicy on the inside. Here is how I make it. 3 eggs beaten with ¼ teaspoon salt and a pinch each of pepper, coriander powder, cumin powder, red chili powder and turmeric powder. In a bowl mix together 2 tablespoons oil, lime juice, coriander powder, cumin powder, turmeric powder, garam masala powder, garlic paste, ginger paste and cilantro leaves. 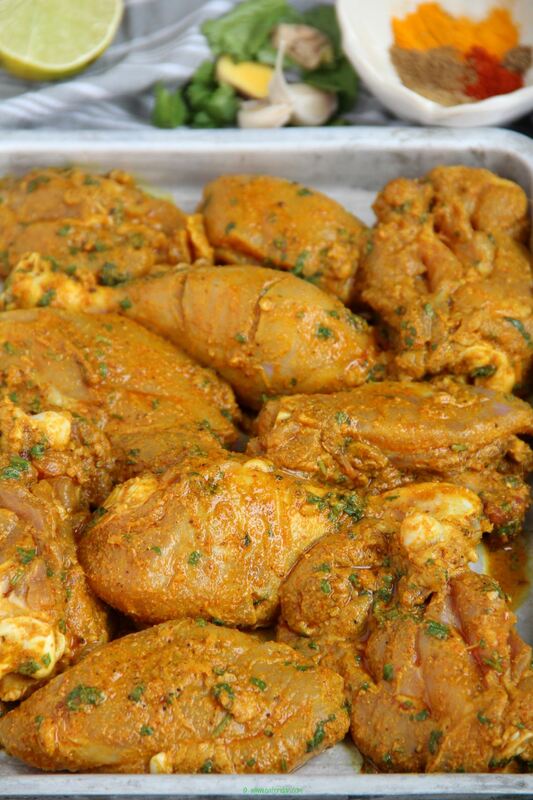 Pat the chicken dry, mix in the marinate and allow to marinate overnight or for at least 6 hours in the refrigerator. Bring the chicken to room temperature and coat well in breadcrumbs or semolina. Heat oil in a frying pan that comes up at least 2-inches deep. In a separate bowl beat 3 eggs with ¼ teaspoon salt and a pinch each of pepper, coriander powder, cumin powder, red chili powder and turmeric powder. Dip each piece of chicken in the egg mixture and deep fry until golden brown on each side. Drain on a paper towel. If you are using bone-in chicken cut one piece slightly in the center to check if it is cooked all the way through. If it is slightly undercooked finish cooking the chicken in a 350-degree preheated oven for 15 minutes.